Our vision is that cycling in Ivybridge should become an integral part of the transport network. It should be a normal part of everyday life, something people hardly think about and feel comfortable doing in ordinary clothes. 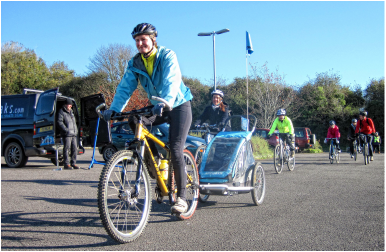 Ivybridge has a growing network of cycle routes around it leading onto Dartmoor, to the coast and into Plymouth. More needs to be done within the town itself and our vision is for a network of joined up safe cycle lanes and multi-use paths leading into the town centre. Whether you own a carbon racer, mountain bike, electric bike, cargo bike or mobility vehicle, we want Ivybridge to feel inclusive. We have engaged with the County Highways Dept, Sustrans, the Town Council and our own M.P. to develop a strategy that is realistic and affordable. Want to Start Cycling but not sure How?